Search Results for "bar spoon"
Happy relaxed cute little girl eating dessert with a spoon in beautiful atmospheric evening beach bar with bokeh lights. Spoon mixes cocktail in jug. Transparent jug with red drink. Alcoholic beverage at the bar. Negroni with red vermouth. 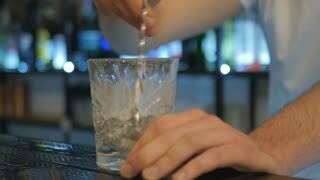 Closeup of a bartender putting ice cubes into a glass and then turning the ice in glass using the bar spoon. A bartender is pouring spirit and liquor into the stirring glass and start to stir along a lot of ice using a long copper bar spoon. 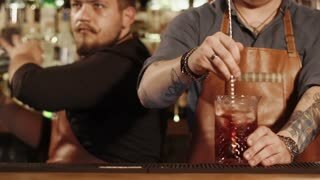 Bartender puts the ice cubes into a glass. A handsome young bartender turns the ice in glass with the bar spoon. Woman is eating dessert with a spoon at bar counter of outdoor restaurant in afternoon with her female friend, looking at barman with surprise and curiosity. Potters hands use a metal bar to polish a clay spoon. Bartender mix bricks of ice in glass by long spoon at a bar. Close up. Bartender mix bricks of ice in glass by long spoon at a bar focus in out. A clay spoon during polishing by a metal bar. Beautiful young business woman eating a cake with a spoon in a cafe on a bar counter background.